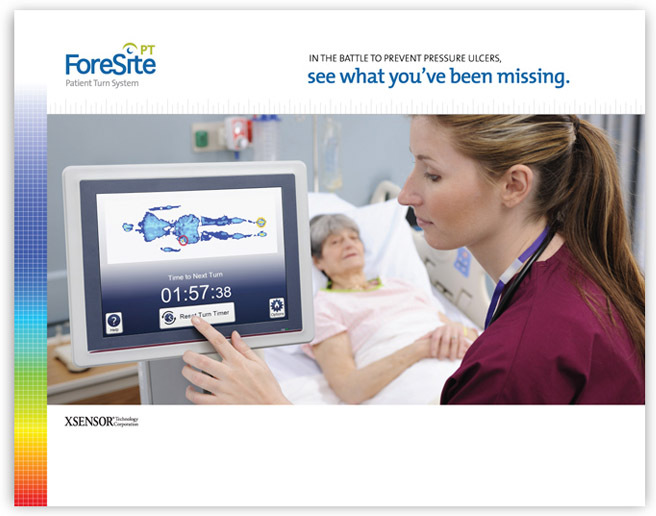 ForeSite was developed by XSENSOR Technology Corporation, developers of pressure imaging systems designed to ensure comfort and safety for a wide range of applications. XSENSOR’s pressure imaging products had been used for product development in the automotive and retail industries. 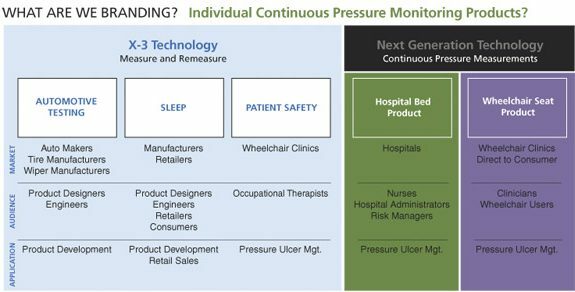 Realizing that this same technology could be used in healthcare, XSENSOR developed a system to help wheelchair users, since sustained body pressures can cause pressure ulcers and other serious health issues. Taking it a step further, they realized they could also develop a monitoring system to measure persistent body pressures in bedridden patients. At this point, with no name recognition or experience in the healthcare market, XSENSOR looked to TR Design for guidance with their product launch. From our research, we compiled a list of competitors’ products and their positioning. We analyzed how XSENSOR was branding its products, including those in other markets and found that they were highlighting the technology and not the health benefits. Despite the fact that each product has a different purpose and might serve a different audience within the healthcare market, all of the products provide the same benefit—pressure ulcer prevention. And since healthcare professionals are interested in patient care and not the technology, we knew the brand messaging and design needed to focus on patient benefits. 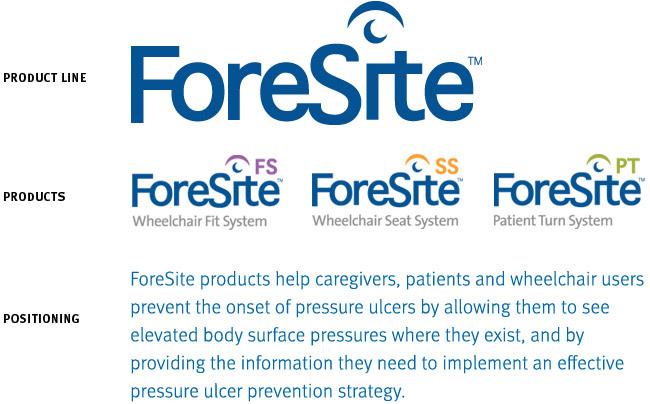 We named the entire line of pressure ulcer prevention products ForeSite, with each product identified by a suffix that relates to the specific product. XSENSOR’s existing site was technology-focused and did not separate products by market. We recommended that the website be redesigned so that the home page displayed each of the major audiences they marketed to. This not only made it easier for prospects to navigate the site, but also allowed for more targeted messaging. 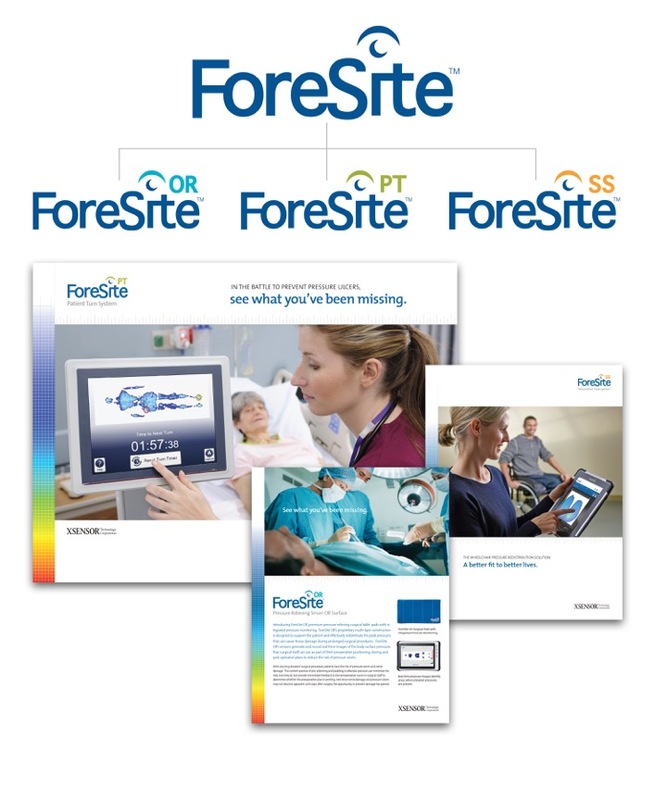 We developed a brand that would work across the entire product line, including the one for ForeSite PT shown here. Engineers are great at creating new technologies and developing new products with applications in the medical market, but when it comes to communicating the value that their product offers, they can sometimes focus too much on features and specifications rather than the clinical benefits. That’s where we were able to help XSENSOR. By focusing the brand on the clinical need (pressure-ulcer prevention) we were able to develop a product name, brand position, brand messaging and brand design that speaks to clinicians who are charged with the responsibility of preventing pressure ulcers. The ForeSite pressure images tell the story in a very clear and colorful way. You look at them and you instantly get it. We wanted to design a look that allowed them to be the main attraction. All the graphics were meant to play a supporting role and emphasize the products’ attributes of color, precision and accuracy.